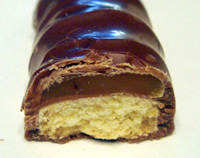 I think it’s safe to say that Twix is one of the all-time greatest candy bars out there (to me anyway). Much like Reece’s PB cups, it’s a simple, yet perfect, combination of ingredients. Cookie, caramel, chocolate. Done. As Twix suggests, the two bars are good for sharing, or not and gives a mild feeling of getting a deal, like TWO candy bars for the price of one! Ethan found these Little Debbie Caramel Cookie Bars at the CVS outlet in lovely Woonsocket, RI and although their format is a single bar the same basic idea of cookie, caramel and chocolate are replicated. I’m not usually one for milk chocolate but I feel this is really the best choice for this bar, it’s nice and soft (although prone to melting quickly if left in the car or something) and biting into these is very satisfying. There something about the gentle yield of the caramel and then crunching into the firm but not too hard cookie bar at the bottom. We both felt the cookie-caramel-chocolate ratio was perfect and the caramel had a nice flavor. Also, I will classify it as a “friendly” caramel that doesn’t want to rip your teeth out, which is always nice to not worry about. These are similar but when we bit into these, we could tell that the ingredient ratio was a little off. Although it doesn’t look like it, Ethan felt there was too much caramel in these and I agreed. Also, the chocolate coating was too thin, as well as having a weaker flavor. The cookie part is more crumbly than Twix and tastes like an animal cracker. Ethan thought it tasted like a donut. The caramel had a weird, papery non-flavor to it. Also noted that this was much sweeter than Twix and actually too much for Ethan to finish. Twix. They really know what their doing both in taste and ingredient balance. The Little Deb’s were just too bland and I think they tried to make up for that by adding more corn syrup. I would honestly say if you’re craving a Twix, this will not be a suitable replacement. 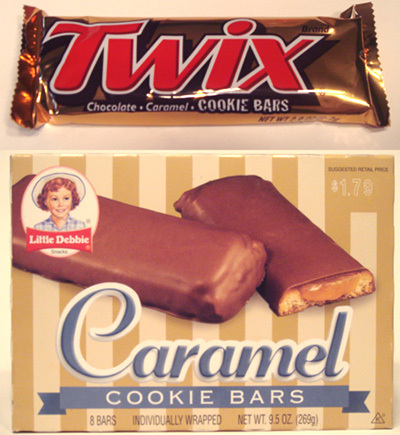 Twix or Little Deb's Caramel Cookie Bar? 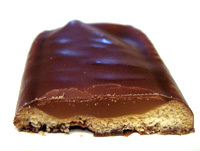 Honestly people……..who voted against the Twix bar? I agree…Twix hands down! I would even go one step further and say it’s the greatest candy bar ever invented. In Australia Twix has two fingers in a packet. The twix definitely looks better. I love Twix! I had one just last week but unfortunately it was stale because the idiot that fills our vending machines doesn’t get the concept of product rotation and shelf life…. I think alot of Little Debbie products belong in the Epic Fail column, except her Swiss Cake Rolls. I like those but that’s about it. Too much caramel? Is there even such a thing? That being said, I still prefer Twix as well. When I was young my mother bought my brother and sister and I way too many carmel cookie bars. I became burnt out very quickly, and now I shiver at the thought of eating another.